The White House and congressional leaders face a critical December 31 deadline for coming to an agreement on how to avoid the so-called “fiscal cliff.” It’s the same kind of pressure they were under in the summer of 2011 when confronted with the choice of raising the debt ceiling or letting the federal government default on its debt obligations. The looming “fiscal cliff” is the outcome of a deal reached during the battle over the debt ceiling. That deal calls for deep, automatic cuts in federal spending to take effect Jan. 1, 2013 if a deficit-reduction deal is not reached. During the debt ceiling debate in July 2011, more than two-thirds of Americans wanted to see lawmakers be willing to compromise. 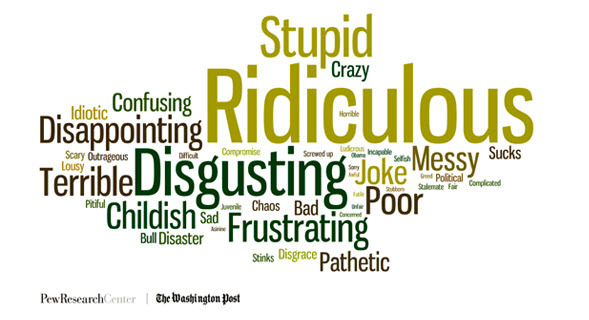 But when a political standoff dragged on for weeks, the public’s one-word reactions were not pretty. President Obama and lawmakers of both parties saw their approval ratings drop as a result of the debt ceiling battle, but Republicans took the biggest hit. Shortly after the debt ceiling negotiations in 2011, only 34% of the public said they viewed the Republican Party favorably (compared to 43% six months earlier); 59% said they had an unfavorable view of the party. While the public was mostly divided over which party could better manage government, there was a consistent perception that the Republican Party was more extreme in its positions than the Democratic Party. As the current negotiations get underway on avoiding the fiscal cliff, our survey conducted just after Election Day found that 53% of Americans said Republicans would be more to blame if an agreement was not reached compared to 29% who said the fault would lie more with Obama. Despite the dim view of how Washington went about its business with the debt ceiling debate in 2011, a majority of Americans predicted — it turned out correctly — that a deal would be reached. This time around, President Obama and congressional Republicans have struck a more conciliatory note than in 2011 about how to avoid the fiscal cliff. Even so, Americans are less optimistic about a deal being reached by the deadline than they were in 2011. For Democrats, 43% had a favorable view of the party (compared to 47% six months earlier); 50% had an unfavorable view. 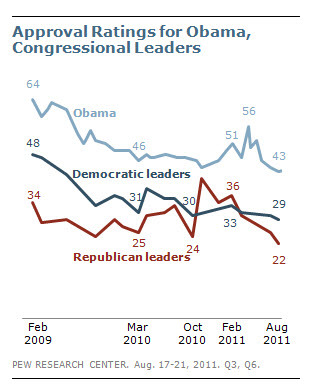 President Obama’s approval rating fell to 43% from 49% six months prior. Divisions are still deep when it comes to approaching government in a bipartisan manner. 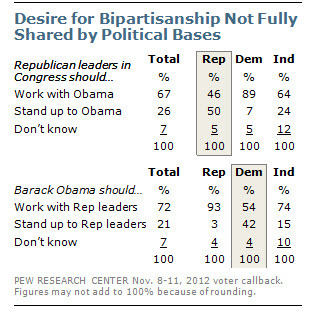 Half of Republicans say party leaders should stand up to Obama; among Democrats, 42% say their leaders should stand up to Republican leaders. If a divide persists among the players in Washington on how to tackle the deficit, it reflects the uncertain mandate from a U.S. public that wants smaller government and to reduce the debt and deficits, but opposes many of the ideas put forward to achieve that goal. 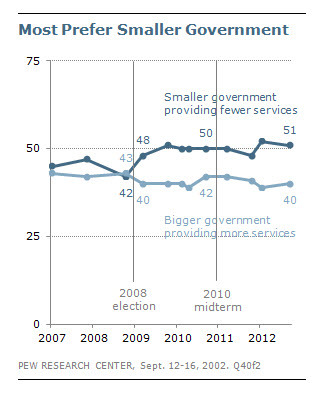 Half of the public now says it prefers a smaller government that provides fewer services. But in our October survey, only two of 12 proposals for reducing the deficit garnered majority support. There are big partisan divides between Republicans and Democrats over many of the proposals that have been made for tackling the deficit. In October, we surveyed supporters of President Obama and Republican Mitt Romney. The proposals reflected in the chart below are ones where the margins of disagreement are smallest. …and gets even bigger on the hot-button issues of raising taxes on the wealthy, cutting defense spending and the social safety net.